Whether it be an intimate lunch/dinner for two, a large group gathering, corporate event, catering for a special occasions or take-out, Rimssie’s aims to please. 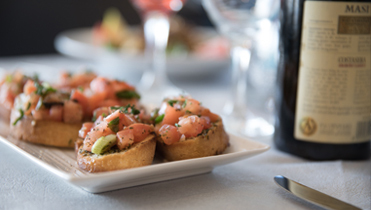 We take authentic flavours of Italy and create dishes inspired by homemade recipes. Since 1996, Rimssie’s has set the standard for quality, flavour and culinary art with particular attention to the freshness of the food we use. We are dedicated to working with the freshest of ingredients to create our detectible dishes, whether it’s at the restaurant or to take home. We also take pride in being able to offer many Gluten Free options to our customers that seek it.